My daughter and one of her best friends unearthed her baby video last Friday night. That video that compiled all her milestones, from the days leading up to her birth, to her first cries in the world, her first bites of solid food, and those precious first steps. All captured. It reminded me of many things, one of which is that my son’s video was never edited, project number one of many, shelved for later (sigh, the woe of being the second born!). But it also reminded me of how things used to be. It brought me back to the days when our world, from morning, noon and night, revolved around their every need. How we anticipated each cry, each sigh, and each giggle. It reminded me of how my husband and I used to be, with each other, and with how we (amateurly) parented. Between the “awwwws” and the chuckles, it was reassuring to see that my husband and I are essentially the same people. The sense of humor and the teasing haven’t changed too much. It reminded me of how much we have gone through together, creating this little family of ours. But it was also woke me up a bit. As the years have gone by and schedules have become crazy, I have gone from parenting intuitively to parenting with the heft of schedules and expectations. From the moment we wake up, to the moment we go to bed, there are deadlines: bell schedules and dinners, activities and bedtimes. Those days of letting the children go at their own pace are long behind us. I’m realizing that barking out orders to brush teeth have replaced an effort to truly understand what my children may be feeling at 7:50 each night. I’m realizing that maybe I was doing a better job as a parent back when I didn’t know as much. I’m realizing that you never know that much. My one consolation in all of this is my husband. Through all of this, we have each other, and we are, at heart, the same. Having him as a partner, we are learning from our mistakes. And we can celebrate our successes. We need to remember that we are doing just fine, in spite of it all. I know this when our children gives us those goodnight hugs, when they want to cuddle, or can’t wait to show us their latest creations. I know this when they tell us what is in their heart. We just have to remember to always listen. Because it’s not always about you. And what does this all have to do with Cauliflower Gnocchi with Creamy Cauliflower Shiitake Mushroom Sauce? Perhaps nothing. Or perhaps everything. What is gnocchi other than a simple dumpling? What is cooking but an act of love? My daughter loves tender dumplings, so I thought this would please her. And my husband has been dropping hints for gnocchi for weeks. I love them too, but have never made them. Instead of using traditional potato, I lightened things up. These (let’s call them “rustic,” shall we? Clearly, I need more practice making them look more like gnocchi) gnocchi are made with cauliflower, a healthier take, but still pillowy and light. 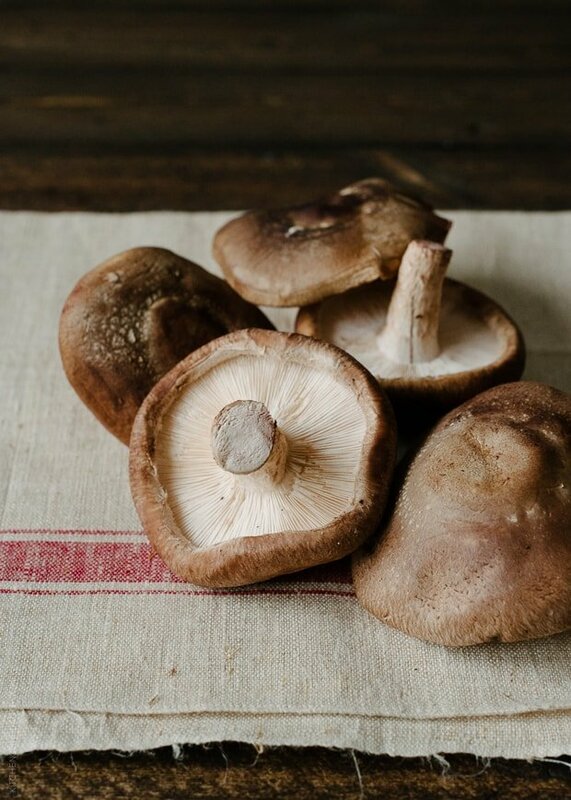 As for the creamy sauce — well, there is no cream — it’s thickened with a puree of more cauliflower and shiitake mushrooms, and if you taste carefully, you’ll note some leeks and garlic sautéed in a touch of pancetta. Gnocchi, I’ve learned, is a labor of love. But just like with those you love, it’s all about what you are willing to give. 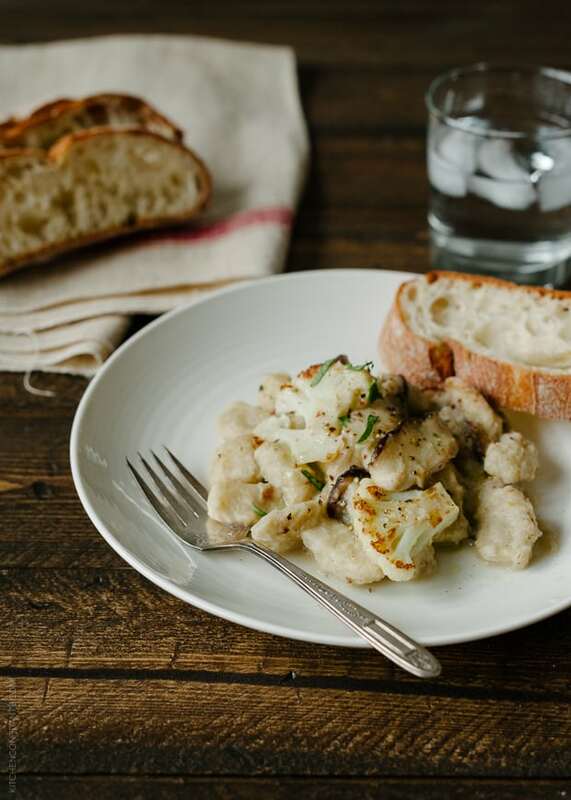 Similar to traditional potato gnocchi, but made with healthy cauliflower, you can barely taste the difference. 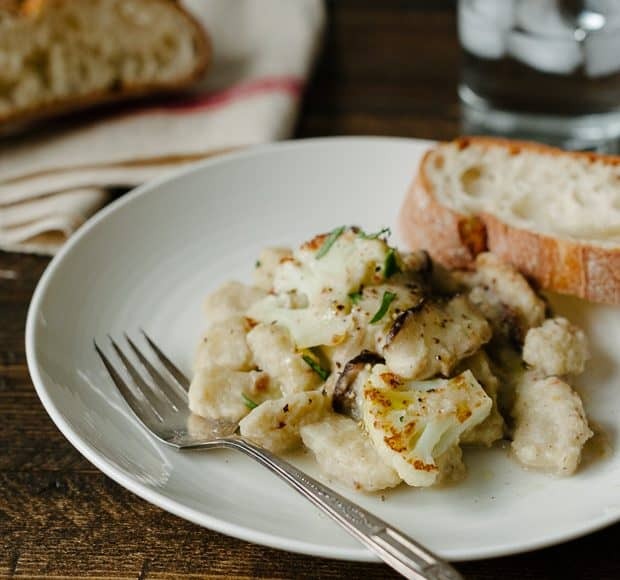 From the gnocchi itself to the "creamy" sauce, potatoes and cream are lightened up with versatile cauliflower. In a medium saucepan, place the cauliflower florets and some of the stems and cover with about 1 inch of water. Bring to a boil and cook until tender, about 4 minutes. Drain well in a colander, then put the cauliflower through a rice mill or ricer placed over a large bowl. If you are like me and do not own one, I learned from Deb at Smitten Kitchen that you can also grate it using a box grater. Add the egg yolks, 1 1/2 cups of flour, salt and nutmeg, and stir until the dough begins to come together. It will be sticky, but gradually add more flour until you achieve a dough that can be kneaded. Depending on the moisture of your cauliflower, you may have to add more flour. Transfer the dough onto a floured surface and knead, dusting with flour if necessary. Divide the dough into 4 pieces, then begin to roll out each piece into a rope about 3/4-inch thick. Cut into 1/2 inch pieces, dust with flour, then use a gnocchi paddle to create the signature grooves. A fork will also work. Transfer to a baking sheet lined with parchment paper and dusted with a little more flour. 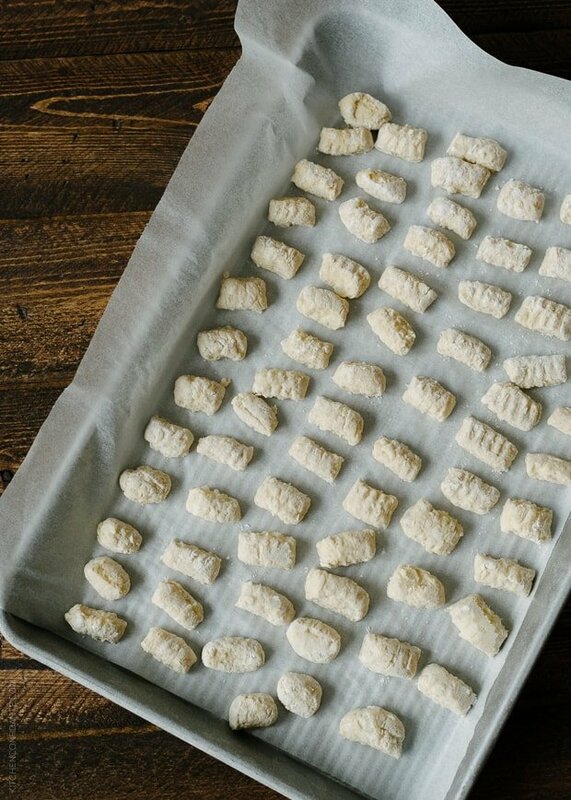 At this point, you can freeze the gnocchi if you are preparing it in advance: cover the baking sheet with plastic wrap and place in a freezer. You can use it the following day, or transfer the frozen gnocchi to a freezer bag if storing for longer. When you are ready to cook the gnocchi, bring a large pot of water to a boil. Prepare an ice bath. Salt the boiling water, then drop the gnocchi (in batches if necessary) and let it cook for about 2 minutes. You will know the gnocchi is ready when it rises to the top. Scoop the gnocchi with a slotted spoon and drop the gnocchi in the ice bath to cool. Reserve about 1-2 cups of the boiling water for the sauce. Drain and dry the cooked gnocchi on paper towels. 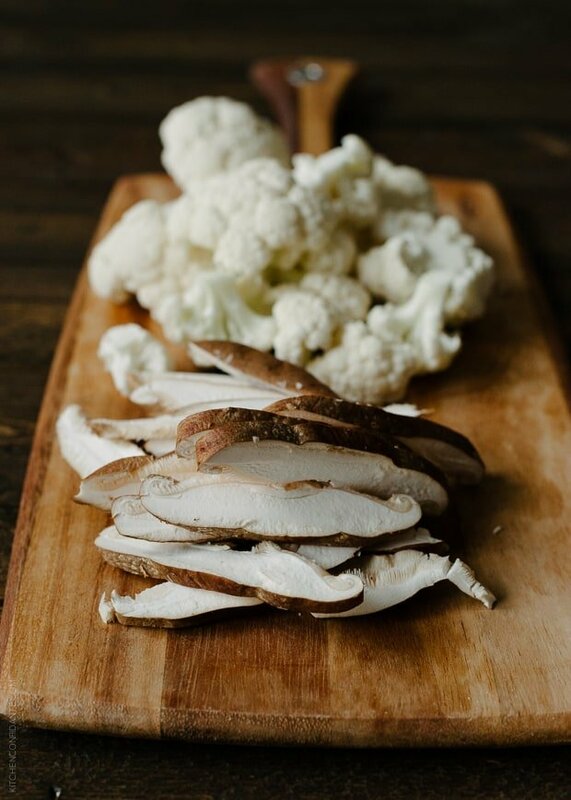 In a large saute pan, heat about 2 tablespoons of the olive oil and cook the cauliflower and shiitake mushrooms until the cauliflower has taken one some color and the mushrooms are tender and wilted. Season with a little salt as you stir. Reserve about half of the cauliflower and mushrooms and set aside. Add the pancetta to the sauté pan and cook until it is brown. Add the leeks and garlic and cook until the leeks are wilted and the garlic fragrant. Stir in the chicken stock and bring to a boil. Carefully transfer to a blender (work in batches if necessary) and blend. Add additional oil to the sauté pan and heat over medium heat. Add the gnocchi and let it brown, carefully stirring. Carefully add the cauliflower sauce. If it is too thick, add some of the reserved pasta water. Season with salt and pepper. To serve, place the gnocchi in serving dish. Top with reserved cauliflower and mushrooms. Garnish with freshly ground black pepper, grated Parmigiano-Reggiano cheese, parsley, and a touch of olive oil if desired. Serve immediately. Gnocchi recipe adapted rom Gnocchi with Creamy Crab Pan Sauce, John Besh, as featured in Food & Wine (January, 2014). Oh my goodness. This is my idea of a perfect, perfect, PERFECT dinner! I definitely need to try this! I love everything you can do with cauliflower. It really is remarkable. Very impressive Liren! I’ve never attempted homemade Gnocchi. You’ve inspired me. 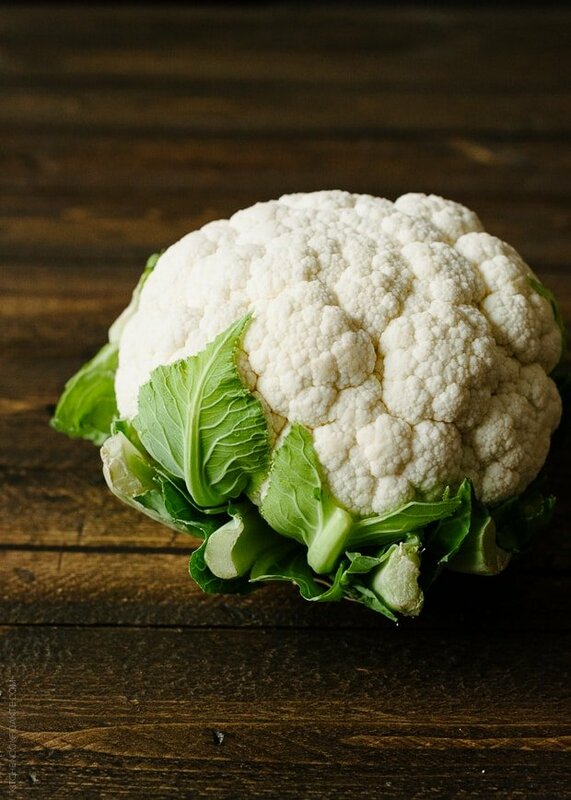 I love cauliflower so this would be the perfect recipe for my first attempt. 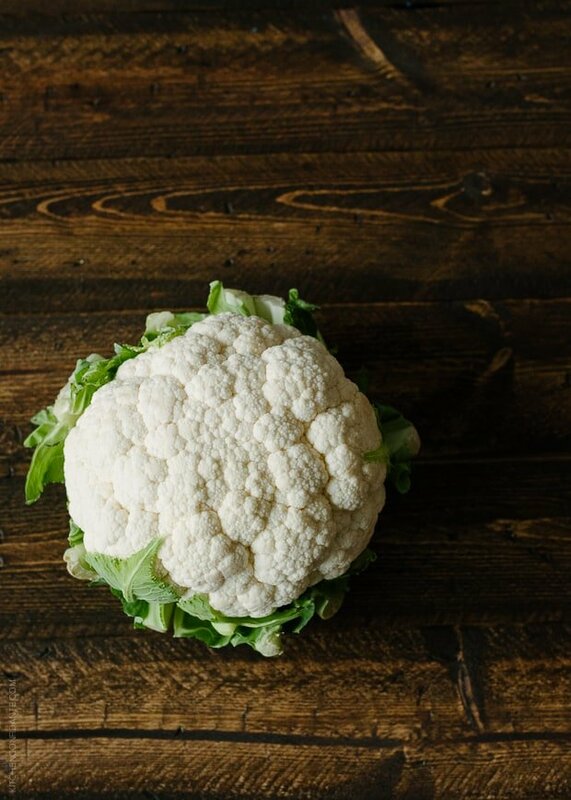 love everything related to cauliflower :) you are an awesome mom! 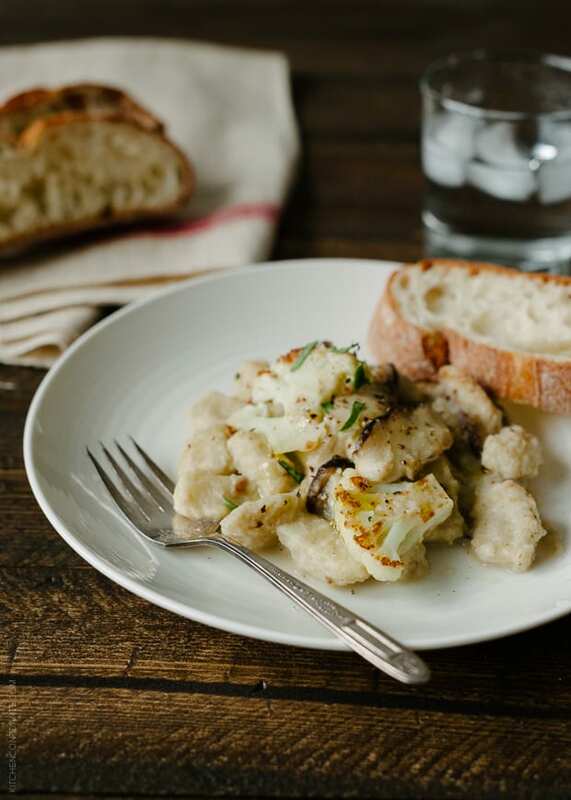 I love gnocchi and that creamy, guilt-free cauliflower sauce sounds incredible! This looks spectacular Liren. Healthy and filling, I’m in love with cauliflower! This is such a beautiful dish & wonderfully unexpected combination. I think cauliflower is a very underrated vegetable that must people associate with french onion dip. Way to class up the cauliflower. Liren I was just telling a friend yesterday that I feel like a Border Collie as it relates to our family schedules. Have you seen them herding sheep? Stealthy, low to the ground, precision focus, rounding the perimeter of the grazing flock to herd them to the target destination. That’s me; all day, every day. I feel so shackled to the logistics management of my family I can’t just relax and enjoy my family. Time moves too quickly and I’m determined not to fritter away the years with my kids at home to this! 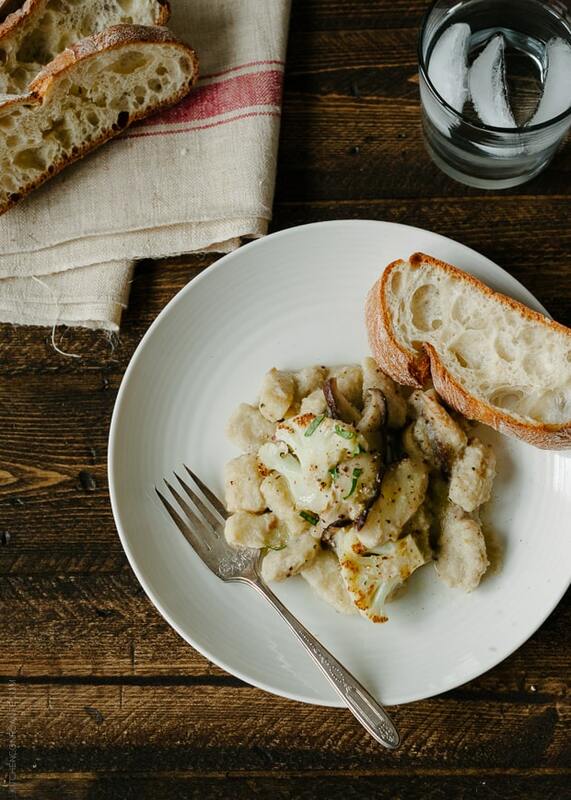 Maybe we’ll make some of this inspired gnocchi today, together, ignoring the clock! Not only does this recipe sound fantastic, but I love your thoughts in this post. The fact that you think about these things shows what a good mom you are. Happy Valentine’s Day! I have pinned it because I really have to try this on a quite weekend. Will definitely be trying this recipe. Looks delish!! I love substituting with cauliflower. One of my favorite recipes is garlic mashed cauliflower. It’s a great sub for potatoes but still satisfies like a starch. Unfortunately that hectic pace doesn’t slow much, but I just have to force myself to slow down more and reflect. You are doing a wonderful job with the kids. I want to try this, I’m going to carve out a little time this week. Never thought of replacing the potato with cauliflower, love it. Hope you are having a relaxing morning, hope to see you soon. The little monsters causing havoc are Asian Ladybird (Ladybug) beetles (Harmonia axyridis) and they can be quite nasty. the idea of marriage and it prevents building a real relationship with a man.